The inception date for BATTIDX was May 1, 2018. Backtested performance is hypothetical and is provided only for informational purposes to indicate historical performance had the index been available over the relevant time period. Investors have requested this information from the index provider as a means to follow the index’s hypothetical performance on a year-to-date basis. 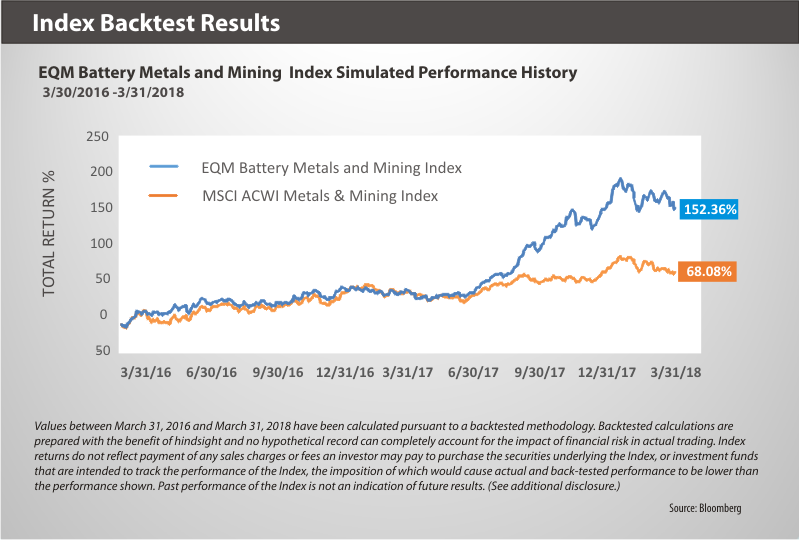 The MSCI ACWI Metals & Mining Index is an unmanaged index is composed of large and mid cap stocks across 23 Developed Markets (DM) countries* and 24 Emerging Markets (EM) countries. All securities in the index are classified in the Metals & Mining industry (within the Materials sector) according to the Global Industry Classification Standard (GICS®) Unless otherwise noted, index returns reflect the reinvestment of income dividends and capital gains, if any, but do not reflect fees, brokerage commissions or other expenses of investing. Investors may not make direct investments into any index.